It’s important to start looking at schools about one year ahead of application. But it’s also important to remember that not every school is right for every child. Make sure to explore and consider the differences between each school – mission, academic programs, extracurriculars, transportation options, before/after care, child’s personality and learning style, parenting style and family values. 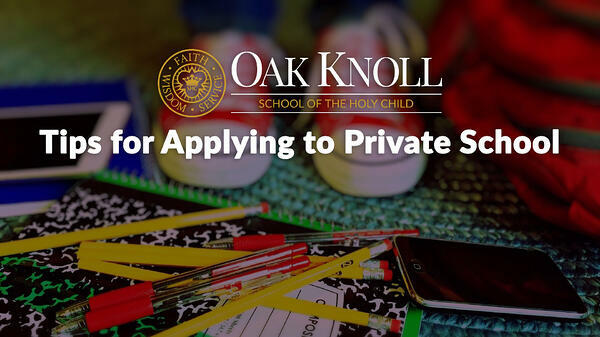 It’s OK – and completely expected – that you apply to more than one school. Searching for the best match for your child takes a lot of homework. Make sure to visit the school – whether it’s during an open house, private tour or other on-campus opportunity. You want to get a good feel of the school, meet the students and faculty. Even if you decide you are not interested in that school, the time you spent helped you decide what you are not looking for, and what is important and what you might trade off. Your reaction and that personal chemistry is important. Seeing your child at that school in those classes helps families to zero in on a good match. You don’t always get a complete picture of the school after the first visit. Oftentimes, after you reflect upon your visit once you leave campus, you find that you have questions. If you still have questions, or would like a second visit, make sure to let the admissions office know. A second visit may give you a different perspective. It’s impossible to get every question answered during your visit. Especially if you attended an open house with many other families, inevitably you will have additional questions. Never hesitate to email your admissions contact or call directly. An admissions counselor would rather answer questions directly than have you assume the answer or waste your time searching online. Admissions counselors are there to help you navigate the process – make sure to take advantage of their wealth of knowledge. When all is said and done, it’s about finding the right fit for your child and entire family. If your child has specific interests, needs, skills and abilities, make sure to be up front with the admissions counselor. Even if that school cannot accommodate your child’s requirements, they may be able to help recommend a more suitable program for those particular needs. Need more help? Read our blog, How to Choose the Right Elementary School for Your Child to help find the right private elementary school for your child.